Los Angeles: Los Angeles police said Tuesday they had arrested the man suspected of murdering rapper Nipsey Hussle, ending a two-day manhunt following the Grammy-nominated artist's shock death. The LAPD said the suspect, Eric Holder, was in police custody in connection with the fatal shooting, which authorities say was not gang-related. The killing in broad daylight triggered an outpouring of grief in LA and among Hussle's superstar peers, who hailed both his musical talents and tireless community organizing. Earlier Tuesday, LA police chief Michel Moore said 29-year-old Holder had verbally sparred with Hussle in front of the rapper's clothing store in south Los Angeles on Sunday. "Holder walked up on multiple occasions and engaged in conversations" with Hussle, the police chief told journalists. The suspect then "came back armed with a handgun" and fired several times at close range, hitting Hussle in the head and body. Two other men who were standing next to Hussle were also wounded. Moore said the shooting did not appear to be linked to any gang rivalry or feud. "We believe this to be a dispute between Mr Hussle and Mr Holder," Moore said. "I'm not going to go into the conversations, but it appears to be a personal matter between the two of them." A massive manhunt was launched after the shooting with police asking for the public's help in locating Holder and his getaway car driven by a woman. Both Moore and Garcetti lamented a recent uptick in violence in south Los Angeles, with the police chief saying: "Nipsey Hussle represents the enormity of the lives we have lost." Nipsey Hussle represents the enormity of the lives we have lost. Authorities urged the community to come together and avoid any further violence. "We have a reason to feel hopeful, even in the moments of our most extreme pain," Garcetti said. "And that's by turning to each other. 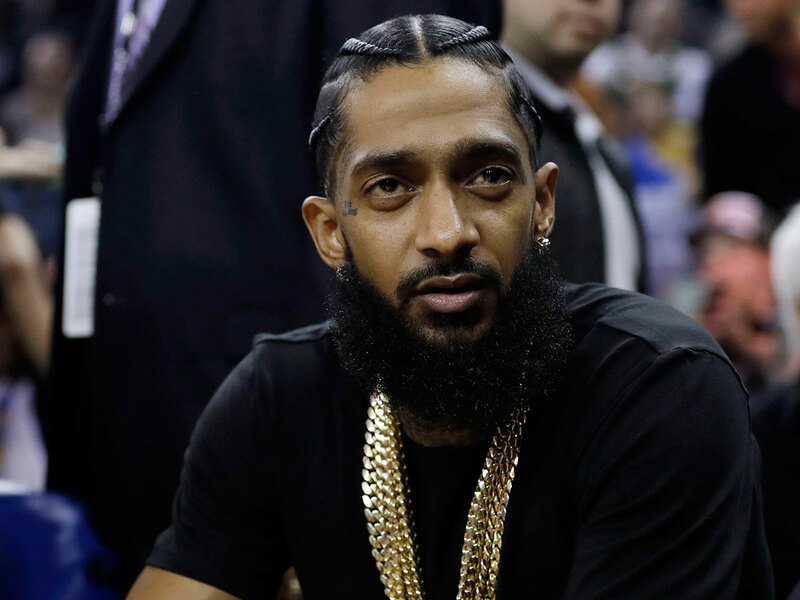 "The absolute worst way to pay back Nipsey's loss - somebody we lost at the hands of violence - is with more violence," he added. "This is about young people of color being able to have opportunity in their lives," he said. Late Monday, a candlelight vigil for Hussle outside of the clothing store where he was gunned down turned to mayhem when a stampede led to several injuries. Moore said the event was peaceful until someone brandished a gun, prompting people to flee in panic. The Los Angeles Fire Department said some 19 people were injured in the stampede, including two with critical injuries. One of those critically injured was reportedly hit by a car. Hussle, born Ermias Asghedom, has been praised by officials in Los Angeles and by his peers for transforming himself from being a gang member to a successful rapper and community organizer who fought for the black and Latino residents of Hyde Park, the south LA neighborhood where he grew up. He was set to meet with local authorities on Monday to discuss ways to end gang violence.